"A310" redirects here. For other uses, see A310 (disambiguation). The Airbus A310 is a medium- to long-range twin-engined wide-body jet airliner that was developed and manufactured by Airbus. Released in 1983, it was the second aircraft to enter production by Airbus Industrie,Note 1 the consortium of European aerospace companies now a subsidiary of Airbus Group. The A310 is a derivative of the Airbus A300, the first twin-engined widebody airliner. During the development of the original Airbus A300, a range of aircraft size and capacity were studied; the resulting Airbus A300B was one of the smaller options. When the A300B1 prototypes emerged, a number of airlines asked for greater capacity, which resulted in the initial production A300B2 version. As the A300 entered service, it became increasingly apparent that there was also a sizable market for a smaller aircraft; some operators did not have enough traffic to justify the relatively large A300, while others wanted more frequency or lower aircraft-mile costs at the expense of higher seat-mile cost (specifically Swissair and Lufthansa). Airbus reduced the Research & Development costs of a smaller A300 to a minimum, studying several early projects called A300B10MC (Minimum Change). Capacity was reduced to 220 passengers, which was then a desired capacity from many airlines. However, this would result in a small fuselage mated to a comparatively large wing and oversized undercarriage, which would make the aircraft burn unnecessarily more fuel as it carries more weight. Another problem was the rate of inflation, which in the UK, during 1979–80, was 35%. This would significantly raise the development costs, and thus the cost of the final product. During the A300's development, Hawker Siddeley Aviation was the subcontractor for the aircraft's wing, after the British government withdrew from the newly formed venture in 1969. HSA subsequently merged with three other companies in 1977 to form British Aerospace (BAe), and by then, the British government had indicated its intentions to rejoin the programme. However, British Airways (BA) and Rolls-Royce did not relinquish their will to collaborate with the Americans, and, in BA's case, buy US aircraft. BA wanted to buy 7N7 and 7X7, which would develop into the Boeing 757 and Boeing 767, with the latter an intended rival to the upcoming A310, as well as the Boeing 747. The French government started talks in May 1976, saying that an order from BA was a condition for re-admission of the UK into Airbus Industrie as a full partner. As this went on, BAe held talks with Boeing and McDonnell Douglas to see if it (BAe) could participate in future programmes, although the company's chairman, Lord Beswick, publicly stated that the aim was really to collaborate in Europe. At the 1978 Farnborough Air Show, Eric Varley, the British Secretary of State for Industry, announced that BAe wished to rejoin the Airbus Industrie as a full partner from 1 January 1979. This would mean BAe would be allocated 20% shareholding and would play "a full part in the development and manufacturing of the A310". From late 1977, before the Varley announcement, BAe started work on the new wing at Hatfield. Simultaneously, Aérospatiale, MBB (Messerschmitt-Bölkow-Blohm) and VFW-Fokker held their individual studies into the new wing. At the April 1978 Hanover Air Show, Airbus exhibited a model A310. Its wing area, at 219.25 m2 (2,360.0 sq ft) was slightly larger than that studied, at 209 square metres (2,250 sq ft); its passenger cabin was 12 frames shorter than the A300,Note 2 accommodating typical passenger loads of 195 in two-class, or 245 in economy. However, during the next 12 months, almost every aspect was further refined. On 9 June 1978, Swissair and Lufthansa developed a joint specification for the aircraft, and within a month, announced that they would place the launch orders. On 15 March, Swissair became the first airline to place a firm order for the type, announcing that it would acquire 10 with a further 10 under option to replace its McDonnell Douglas DC-9s on its major intra-European routes. Lufthansa quickly placed a $240 million 10-aircraft order. Air France and Iberia shortly followed. The increasingly strong interest in the aircraft, coupled with the recovery of the industry in the late 1970s, led Airbus to launch the A300B10, now known as the A310, into production on 7 July 1978. On 1 April 1979 Lufthansa raised its commitment to 25 orders and 25 options. Two days later, KLM signed its order for 10 orders and 10 options at ₤238 million. On 6 July 1979 Air France raised its order from 4 to 35. Other airlines announcing orders for the A310 during 1979 included Martinair, Sabena and Air Afrique. Initially, two versions of the A310 were planned, the regional A310-100 and the transcontinental A310-200. The A310-100 had a range of 2,000 nmi (3,700 km) with 200 passengers, whilst the -200 had a higher MTOW and centre section fuel, and could carry the same load a further 1,000 nmi (1,900 km). Basic engines offered included the General Electric CF6-45B2 and Pratt & Whitney JT9D-7R4. Rolls Royce at one time considered offering an engine for the A310 but dropped the program. The range of the A310 exceeds that of the A300 series with the exception of the A300-600R, which surpasses that of the A310-200. The A310's greater range has led to the aircraft being used extensively on transatlantic routes. The A300 and A310 introduced the concept of commonality: A300-600 and A310 pilots can cross-qualify for the other aircraft with one day of training. Sales of the A310 continued and by the time the prototype A310-200 aircraft made its first flight on 3 April 1982, orders and options for 181 aircraft had been placed by 15 airlines worldwide, a somewhat better start than that of the original A300. It was clear that the longer-range series −200 aircraft was the more popular aircraft and Airbus decided in 1979 to stop offering the low gross weight series A310-100 (originally proposed for Lufthansa), none of which were built. Demand for the aircraft began to slacken and there were no new A310 passenger orders during the late 1990s, due to the introduction of the advanced technology Airbus A330; the last A310 delivery was in June 1998. The A310 (along with the A300) officially ceased production in July 2007, though an order from Iraqi Airways for five A310s remained on the books until July 2008. The remaining freighter sales were to be fulfilled by the new A330-200F derivative. The A310 was marketed as an introduction to widebody operations for developing airlines. The A310 was replaced in Airbus' lineup by the highly successful A330-200, which shares its fuselage cross-section. Between 1983 and the last aircraft produced in 1998, 255 A310s were delivered. As of July 2016, 47 A310s remain in commercial service; major operators are Air Transat and Mahan Air with 9 aircraft each; Fedex Express (8) and Pakistan International Airlines (4), another 9 airlines operate 17 aircraft between them. 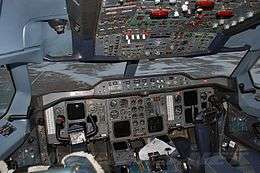 The aircraft has a two-crew "glass" cockpit as standard using CRT displays in place of the more traditional instrumentation as well as modern electronic systems. The A310 flight deck was incorporated into the A300-600 enabling a dual type rating to be achieved. The flight deck has provisions for third and fourth crew seats. The A310 is available in two basic versions, the medium range −200 and the longer range −300. The first version of the aircraft to be developed was the −200 but this was later joined by the −300 which then became the standard production version of the aircraft. The first A310, the 162nd Airbus off the production line, made its maiden flight on 3 April 1982 powered by the earlier Pratt & Whitney JT9D-7R4D1 engines. The −200 entered service with Swissair and Lufthansa a year later. Late series −200 also featured wing fences identical to those of the −300. The first three A310s were initially fitted with outboard ailerons; they were later removed once testing showed them to be unnecessary. A convertible version, the seats can be removed and cargo placed on the main deck. The freight version available as a new build or as a conversion of the existing wide-bodied aircraft. The A310-200F freighter can carry 39t of freight for 5,950 km. No production freighters of the A310 were produced. 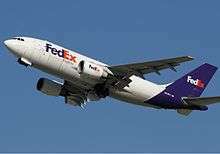 Operators such as FedEx Express acquired modified ex-passenger A310s, usually starting with the −300 version. First flown on 8 July 1985, the −300 is dimensionally identical to the −200, although it provides an increased Maximum Take-Off Weight (MTOW) and an increase in range, provided by additional centre and horizontal stabilizer (trim-tank) fuel tanks. This model also introduced wingtip fences to improve aerodynamic efficiency, a feature that has since been retrofitted to some −200s. The aircraft entered service in 1986 with Swissair. 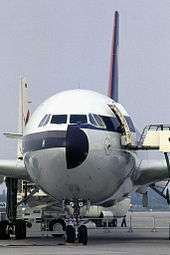 The A310-300 incorporates a computerised fuel distribution system which allows it to be trimmed in flight, optimising the centre of gravity by shuttling up to 5,000 kg (11,000 lb) of fuel in and out of the horizontal stabilizer tank, controlled by a Center of Gravity Control Computer. 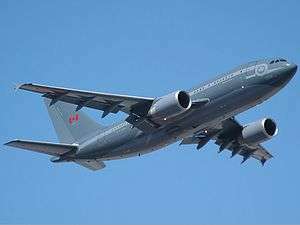 The A310 has been operated by many of the world's air forces as a pure transport (A310-300 MRT), however several have now been converted to the "Multi Role Tanker Transport" configuration by EADS, providing an aerial refueling capability. 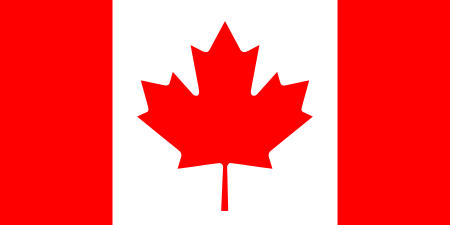 At least six have been ordered; four by the German Air Force and two by the Canadian Forces. Deliveries began in 2004. Three were converted at EADS EFW in Dresden, Germany; the other three at Lufthansa Technik in Hamburg, Germany. Royal Jordanian Air Force - Former operator. By the end of production a total of 255 A310s had been ordered and delivered. As of September 2015 there have been 12 hull-loss accidents involving A310s with a total of 825 fatalities; and 9 hijackings with a total of five fatalities. 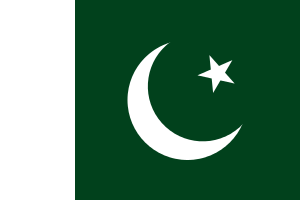 26 March 1991: Singapore Airlines Flight 117 carrying 123 passengers and crew, was hijacked by 4 male Pakistanis en route to Singapore. The aircraft landed at Singapore safely where the Singapore Armed Forces Commando Formation stormed it and killed the hijackers. None of the hostages were hurt. 31 July 1992: Thai Airways International Flight 311, an A310-304 carrying 99 passengers and 14 crew, crashed on approach to Tribhuvan International Airport,Kathmandu. All 113 on board were killed. 11 February 1993: Lufthansa Flight 592 carrying 94 passengers and 10 crew members that was hijacked by a 20-year-old Ethiopian man, Nebiu Demeke at the John F. Kennedy International Airport near New York City, United States. All passengers and 10 crew on board survived. 23 March 1994: Aeroflot Flight 593, an A310-300 carrying 63 passengers and 12 crew, crashed in Siberia after the pilot let his son sit at the controls and the autopilot partially disconnected. All 75 on board were killed. 31 March 1995: TAROM Flight 371, an A310-324 carrying 50 passengers and 10 crew, crashed in Baloteşti next to Otopeni International Airport near Bucharest in Romania after a jamming of the throttle on the starboard engine followed by a lack of reaction by pilots. All 60 on board were killed. 11 December 1998: Thai Airways International Flight 261 crashed near Surat Thani Airport in Thailand. There were 101 fatalities and 45 survived with serious injuries. 30 January 2000: Kenya Airways Flight 431, an A310-300 crashed in the Atlantic Ocean shortly after takeoff from Abidjan in Côte d'Ivoire. 169 passengers and crew were killed, and 10 passengers survived with serious injuries. 12 July 2000: Hapag-Lloyd Flight 3378, an A310-304, crashed during an emergency landing near Vienna in Austria due to fuel exhaustion. All 142 passengers and 8 crew on board survived. 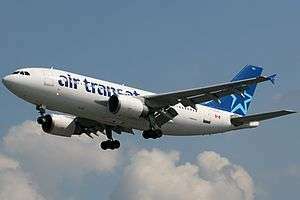 6 March 2005: Air Transat Flight 961, an Airbus A310-308, en route from Cuba to Quebec City with nine crew and 261 passengers on board, experienced a structural failure in which the rudder detached in flight. The aircraft returned to Varadero, Cuba, where they made a safe landing. The crew made no unusual rudder inputs during the flight nor was the rudder being manipulated when it failed; there was no obvious fault in the rudder or yaw-damper system. Subsequent investigation determined that Airbus' inspection procedure for the composite rudder was inadequate; inspection procedures for composite structures on airliners were changed following this accident. 9 July 2006: S7 Airlines Flight 778, an Airbus A310-324 from Moscow carrying 196 passengers and eight crew, overshot the runway at Irkutsk in Siberia, plowed through a concrete barrier and caught fire as it crashed into buildings. Reports said that 70 of the 204 on board survived, with 12 missing. 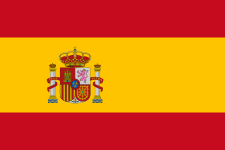 Since the accident, casualty figures have fluctuated, in part due to three people boarding the aircraft who were not on the passenger manifest, and some survivors walking home after being assumed trapped in the wreckage. 12 March 2007: Biman Bangladesh Airlines Flight 006, an A310-325 carrying 236 passengers and crew, suffered a collapsed nose gear during its takeoff run. Fourteen people suffered minor injuries in the accident at Dubai International Airport. The aircraft came to rest at the end of the runway and was evacuated, but blocked the only active runway and forced the airport to close for nearly eight hours. The aircraft was written off. 10 June 2008: Sudan Airways Flight 109, an A310-324 from Amman, Jordan carrying 203 passengers and 11 crew, ran off the runway while landing at Khartoum International Airport during bad weather. Soon afterward a fire started in the aircraft's right wing area. A total of 30 people were killed. 30 June 2009, Yemenia Flight 626, an A310-324 flying from Sana'a, Yemen, to Moroni, Comoros crashed into the Indian Ocean shortly before reaching its destination. The aircraft was carrying 153 passengers and crew; there was one survivor, a 12-year-old girl, Bahia Bakari. ex-Nigeria Airways A310-222 5N-AUG is now the Italian restaurant All Italia in Gilly, about 5 km south of Brussels Charleroi Airport. ↑ Gunston 2009, p. 85. ↑ Gunston 2009, p. 86. ↑ Gunston 2009, p. 87. 1 2 3 4 5 Gunston 2009, p. 89. ↑ Gunston 2009, p. 91. ↑ "Airbus aims to fill freighter void with A330 derivative." Flight International, 14 March 2006. ↑ "World Airliner Census" (PDF). Flight International. July 2016. p. 5. ↑ "A310 Europe builds on Airbus success." Flight International, 27 February 1982. ↑ Learmount, David (1982-07-03). "A310 keeps beating its targets". Flight International: 34. Retrieved 2015-12-29. ↑ "A310-200F Freight version." Aerospace Technology. Retrieved: 6 November 2011. ↑ "Airbus A310." Aviation Safety Net. Retrieved: 30 September 2015. ↑ "Russian plane's 'brakes failed'." BBC News, 9 July 2006. Retrieved: 10 April 2007. ↑ "Russian plane lost control upon landing." The New York Times, 10 July 2006. Retrieved: 11 April 2007. ↑ "ASN Aircraft accident Airbus A.310–325 S2-ADE Dubai Airport (DXB)." Aviation Safety Network. Retrieved: 6 November 2011. ↑ "30 people killed in Sudan Airways crash – statement." Sudan Tribune, 11 June 2008. Retrieved: 12 November 2010. ↑ "Yemenia Airbus black box found." stuff.co. Retrieved: 15 April 2015. ↑ Amir, Ahmed, Andrew Cawthorne and Jon Hemming. "Yemeni plane crashes in Comoros, 150 on board." Reuters, 29 June 2009. Retrieved: 30 June 2009. ↑ "A310 Airplane Characteristics for Airport Planning" (PDF). Airbus. 2002. 1 2 "A310". Aircraft Technical Data & Specifications. Airliners.net. ↑ "Out-of-production / A310". Airbus. 1 2 3 4 5 "Type Certificate Data Sheet" (PDF). EASA. 30 April 2014. Gunston, Bill. Airbus: The Complete Story. Sparkford, Yeovil, Somerset, UK,: Haynes Publishing, 2009. ISBN 978-1-84425-585-6. Norris, Guy and Mark Wagner. Airbus. St. Paul, Minnesota: MBI Publishing, 1999. ISBN 0-7603-0677-X. "World Airliner Census". Flight International, Volume 184, Number 5403, 13–19 August 2013, pp. 40–58. ^1 A consortium of European aerospace companies, Airbus is now fully owned by EADS and since 2001 has been known as Airbus SAS. ^2 The fuselage is 14 frames (7.42m) shorter than the A300 fuselage, but the rear bulkhead was set 2 frames farther into the tailcone, so that only 12 frames of seating capacity were lost in the shortened version.